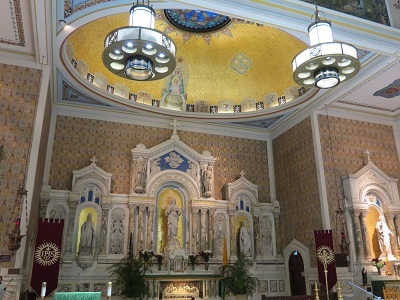 First Tridentine Mass Celebrated on New High Altar at Our Lady Queen of Martyrs A welcome and uncommon sight has debuted at Our Lady Queen of Martyrs Church in Beverly Hills, Michigan: a newly constructed High Altar. 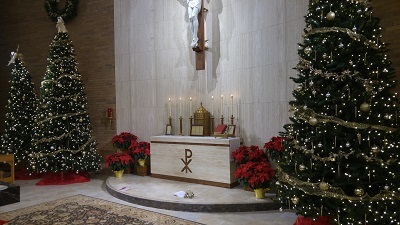 Taking the place of the former simple tabernacle stand, the new High Altar is part of a remodeling of the church’s sanctuary. This past Wednesday, January 6, the new altar was inaugurated with its first Holy Mass in the Extraordinary Form, celebrated by Fr. Clint McDonell. Members of the Oakland County Latin Mass Association and the St. Benedict Tridentine Community provided key support as ushers, singers, and altar servers. Next up: Pastor Fr. Scott Thibodeau hopes to install a new Communion Rail, provided that funds can be raised. Each of the three sections of the rail will cost at least $7,000. After several years of dormancy, the Latin Liturgy Association is coming back to life under new President Regina Morris of St. Louis, Missouri. Newsletters are once again being published, and the web site listing of Latin Masses in the Ordinary Form has been updated. The most recent newsletter makes mention of Regina’s recent visit to the Oakland County Latin Mass Association and the St. Benedict Tridentine Community to substitute for Wassim Sarweh. For membership information and the directory, please visit www.latinliturgy.com. Let’s hope that another National Convention like the one we hosted here in Detroit and Windsor in 2010 is included in their plans for the future. Viewers of Extraordinary Faith may recognize the sites in Miami from the episodes filmed there. Side trips to Epcot and to the Everglades are included. Pilgrims will fly to Florida, then be transported by van. For information or to register, visit www.prayerpilgrimages.com or call Michael Semaan at (248) 250-6005.